To date, 154 different species of butterflies have been registered in the Faroe Islands. Most of them do not breed here, but arrive with the help of warm currents of air from the south, sometimes all the way from Southern Europe and Africa. New species are constantly being registered. It can be mentioned as an example that only 54 species had been registered in 1954 and that this had increased to 106 by 1999. Compared with the countries that lie to the south of the Faroes, 154 species is no great number. In Denmark, for instance, 2,500 species have been registered. None of the species mentioned here are native to the Faroes, but can be seen here from time to time. The painted lady, Vanessa cardui, and the peacock butterfly belong to the brush-footed family, Nymphalidae, and fly during the day. The hawk-moth, Agrius convolvuli, and the death’s-head hawk-moth, Acherontia atropos, belong to the Sphingidae family of moths and fly from twilight until late at night. The peacock butterfly is a rare guest in the Faeroes and was first registered here in 1938. The species is native to the countries south of us, such as Great Britain, Denmark and Norway. It has a wingspan of between 5-6 cm and an eye-spot at the tip of all four wings that resemble the ‘eyes’ on a peacock’s tail. The caterpillar, which lives on stinging nettles, (Urtica dioica) has been found in the Faroes only once and that was at Haldórsvík in 1992. In the countries the peacock butterfly is native to, it usually hibernates in such locations as warehouse buildings so it sometimes arrives in the country together with freight. The painted lady has a wingspan of 5-6 cm and is resident in North Africa. It is not seen in the Faroes every year, but some years see an invasion of them, such as in 2009, which has been called a record year throughout Europe. When they come to the Faroes they fly immediately to the top of the mountains. This phenomenon is known as “hill topping” and gives them a fine opportunity to find a mate once they have arrived in the new country. They then lay their eggs on the creeping thistle (Cirsium arvense) and on stinging nettles (Urtica dioica) that the caterpillars feed on. A new generation hatches in the autumn if the summer has been fine and the butterflies fly south to winter in warmer countries. The first time we hear about the painted lady in the Faroes is from expeditions during the period 1863-68. 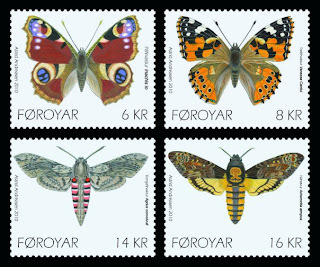 The butterfly can travel long distances and one found its way to the far north in Svalbard in 1978. The hawk-moth, which was first registered in the Faroes in 1947, comes from North Africa. Eleven of them were observed in the Faroes in 2003 and, as they are very rare here, this constituted a record year. They can have a wingspan of 12 cm and can fly as fast as 55 kilometres an hour. The hawk-moth lives on nectar and, like the hummingbird, it can hover in mid-air on its rapidly-beating wings while it feeds on nectar with the help of its long proboscis. The caterpillar lives on various species of the Convolvulaceae family, in the Faroes on plants of the dock family, Rumex. The female moth lays between 150 and 200 eggs, but the population has declined greatly. This is due to the fact that the caterpillar lives in areas where potatoes are grown and the commercialisation of potato-growing has led to the use of large quantities of pesticides. New, modern agricultural machinery is also believed to have had a negative effect on the population.